HD. Entrance at Lungarno Serristori - Piazza Poggi. 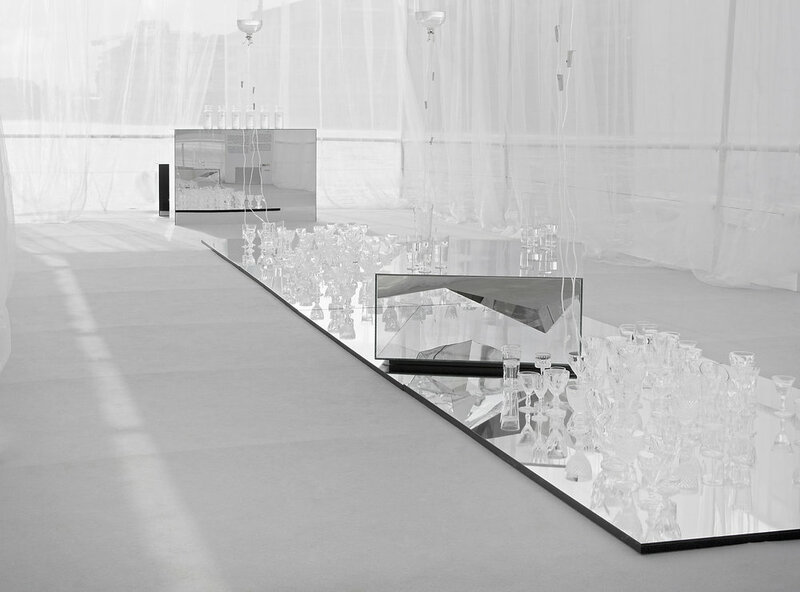 In collaboration with SkyArte HD, LUISAVIAROMA pays homage to Florence with a group show on water, a meditation on the expressivity of form and sensory exploration. Through multiple design languages, the participating artists, designers and galleries have been asked to interpret the theme according to their unique thoughts and poetry. 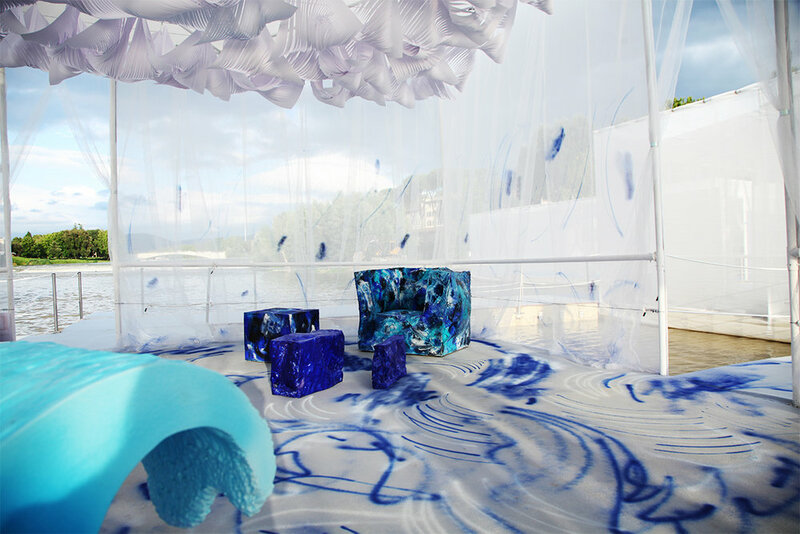 Divided into six stages, “Design on Water” is an experiential exhibition, a path about the ongoing search for being. Water, like in nature, takes different forms: solid, glassy, liquid and gaseous. Water is a symbol of rebirth and divine blessing that invites the viewer to reflect on the latent power of the material element and the meaning of life. 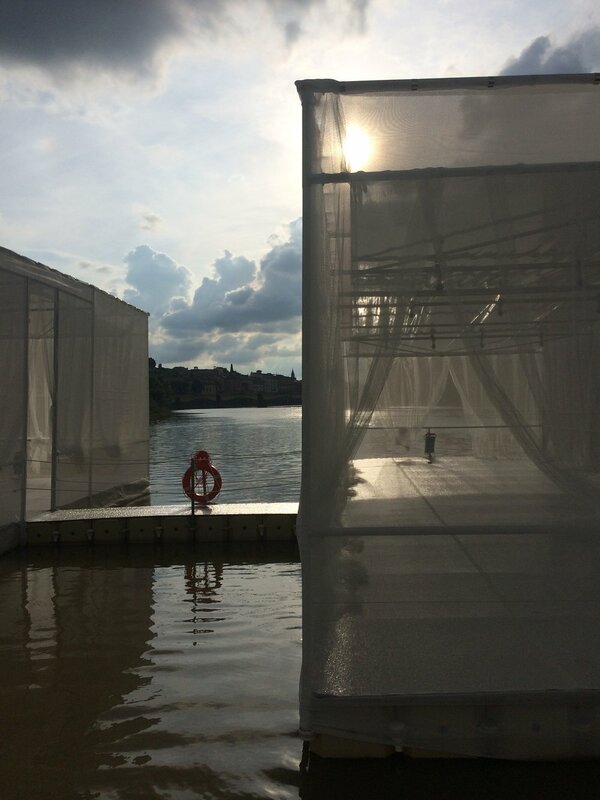 On the occasion of the 50th anniversary of the flood that submerged Florence in 1966, “Design on Water” proposes a conscious path through an exhibition that brings to light one of the most controversial and problematic challenges facing the world, that of immigration. A visionary journey in which the viewer “navigates” through his or her own perceptions in a totalizing perspective where the environment—not only physical but also social and temporal—becomes a fundamental part of the installation. 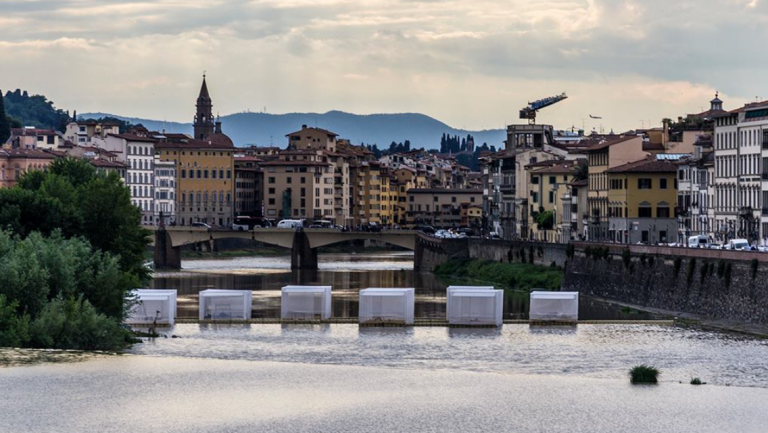 "The Bridge of Love", the floating installation designed by architect Claudio Nardi, represents is a symbol of hope and solidarity. Already a well-known character of many legends and literary works, the whale becomes the undisputed protagonist of the installation by MAGIS, interpreter of the company’s values as a “dream factory” more than a producer of consumer goods. The viewer is invited to repaint the largest whale in the world in an original way. While the real blue whale measures 33 meters long and weighs up to 160 tons, its reproduction is made of white cardboard to emphasize the company’s commitment to green practices: eco-certified production methods with a low impact that create products with a long life cycle. The Whale My Zoo designed by Martí Guixé communicates the importance of preserving these creatures which have been threatened for centuries by uncontrolled hunting and pollution, subsequently disrupting the habitat of the oceans. Originally from the story of Jonah, reported in the Old Testament, the fairytale written by Carlo Collodi and later reinterpreted by Walt Disney identifies the belly of the whale as a space of human growth. The mystical allegory presents the animal’s stomache as a place of human consciousness which serves to overcome fears and acquire spiritual or intellectual reason. Marcantonio uses a rarefied, symbolic poetry made of raw and hyper-realistic forms. Heart with Waterlily (“Cuore Con Ninfea”) is placed at the heart of the installation as an independent sculpture and allegory of artist as interpreter of nature. CTRLZAK Studio and JCP present water as a sensual element, life as the origin and womb of all things. Playing with transparency and reflection, water is a mirage that fuses art and design in an alchemical way. "To look, listen and sample are just some of the actions implemented through Waterness, a path of personal awareness and reconsideration of the value of water and our direct relationship with this." 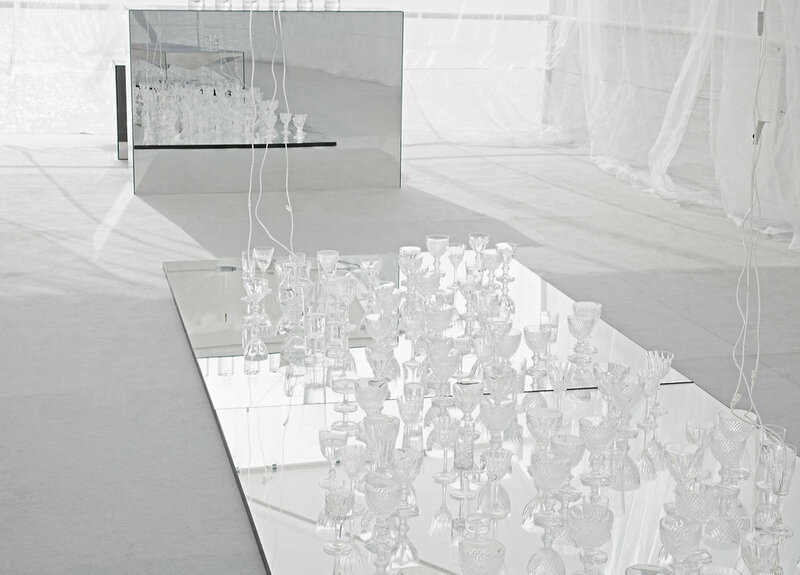 The installation “Dolmlod” in the middle of the room is a table designed for JCP, displaying a multitude of glasses and decanters made of borosilicate glass of different sizes filled with water that drips from the ceiling. Waterness is completed with a tasting of different types of water. Dilmos presents Daniele Papuli, an artist from Apulia who transforms paper into unique works of contemporary design. “Rippled Wave” is a theatrical and suggestive representation of water as a fluid element with infinite variation. On the ceiling a wide white wave interspersed with light and in blue descends and crosses the streams of a source. The luminous infiltration reveals shadows, leaving space to the visitor who approaches the work and discovers it like a treasure. Light and ethereal sculptures describe water through its density, reflections, ripples, depths and vibrations that appear within Design on Water. Lagoona is populated by mythical creatures that lurk in the obscurity of the sea. Out of his precious universe of ceramics, Matteo Cibic tells the myth of the deep sea presenting gigantic and ferocious beasts, which in the collective imagination induce fear in sailors. These original works for Dodo were presented at Milan’s Salone del Mobile. On occasion of Underwater Love, they transform into a marine bestiary emerging from fog and water like monsters capable of ferrying us, with their dreamy eyes, towards a visionary and surreal world full of bibliographic references. Secondome Gallery presents an installation by Stefano Marolla, in which furniture is an object evocative of identity and family. The artist’s moving works, who forges sheets of wood by Palissandro Santos, molding them as the waves of the sea with the remains with which they come across. The visual power corresponds to a rational rigor, the theatrical dimension to the rule. "My work is an organic work, inspired by draping, waves, dunes. It’s a work in movement. Each piece creates itself. I can only control it a little. I never know which waves will ride my sheet of wood." Bitossi Ceramiche and Alessio Sarri present a metaphorical ceramic installation dedicated to the sea where, on the surface of the water, birds migrate to new and luminous shores. Whether speaking about the movement of a single person or a group, as individuals or a flock, movement caused by nature or social factors, the decision to leave a place to reach another always has more than one reason, generating a complex and controversial phenomenon. The possibility to be reinvented is the way of man when creating a new habitat capable of welcome. Aldo Londi, artistic director of Bitossi Ceramiche for over four decades, creates a expressive language made up of matter and form painted in an unmistakable color: blue. Here he presents the “Birds” series, in creation since 1955. To the tune of “Time Waits for No Man” by Lisa E.Harris, the installation by Lapo Ciatti takes inspiration from the word "Rope" which in case of necessity, become a solid support to throw into the sea and hold onto. "Swimming in the Adriatic Sea at Lido Island, I imagined every palm leaf to be a person that risked or sacrificed their life for a better life in Europe. Every time a leaf would touch me in the ocean, I would pray for them. I knew I had to respond artistically to what is happening in the world." 19 Ropes represent the hope of a better life, away from war, persecution and famine. An explosion of red flowers born from an idea by Gherardo Frassa and manufactured by Fiori di Latta symbolize comfort and consolation. Red poppies symbolize love, the only force that can overcome adversity at sea and on land.